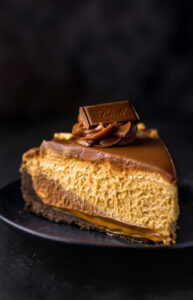 If you try this recipe for Creamy Milk Chocolate Peanut Butter Pie, let me know what you think! 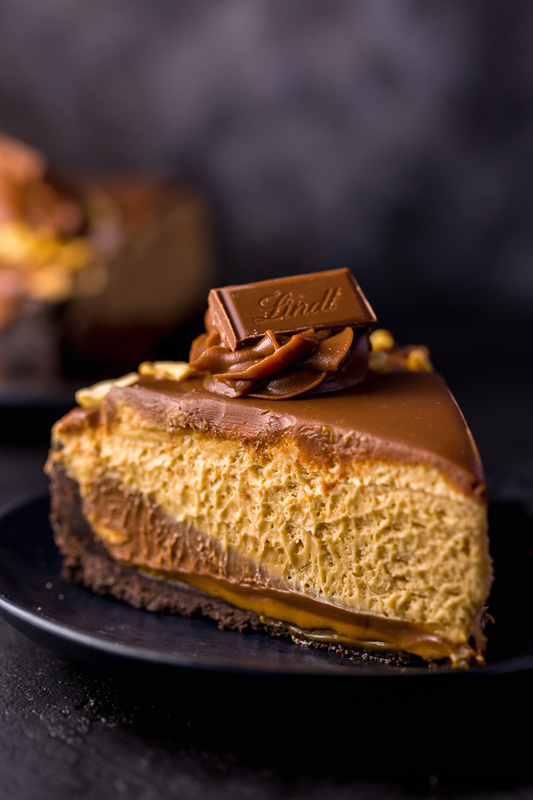 And don’t forget to snap a pic and tag it #bakerbynature and #Lindtlove on instagram! 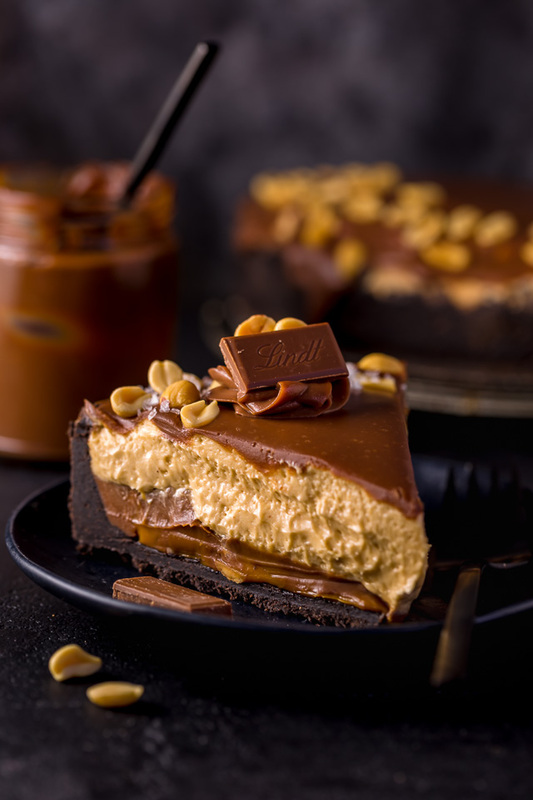 An absolutely delicious recipe for No-Bake Milk Chocolate Peanut Butter Pie! Press the crust into the prepared pan, pressing it firmly down in the middle and up the sides. Place crust in the freezer while you prepare the fillings. 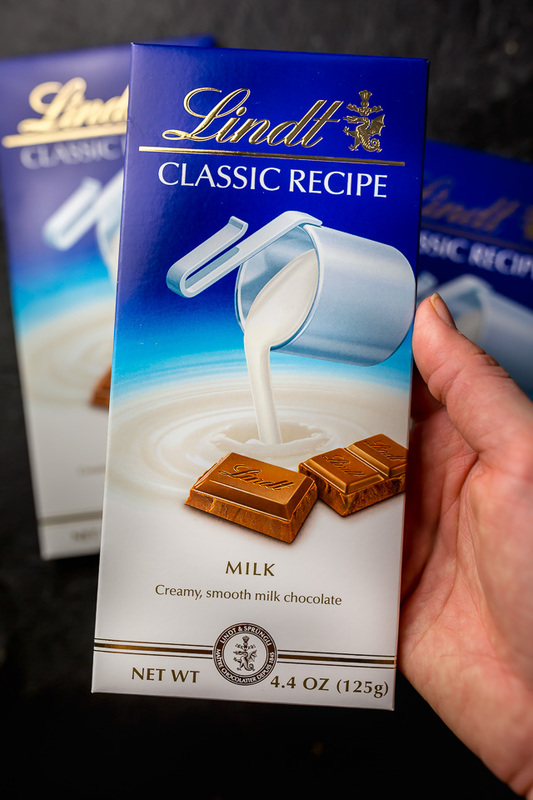 Place the chopped milk chocolate in a heatproof medium bowl; set aside. In a small saucepan over medium-heat, bring the cream and sour cream to a low simmer. Remove from heat and whisk well to combine. Pour the cream on top of the chopped chocolate and whisk well to combine. Fold in the peanuts, then set aside. Remove the crust from the freezer. Spread the Dulce de Leche evenly across the bottom, then pour the chocolate filling on top. Place the pie back in the freezer while you make the peanut butter filling. 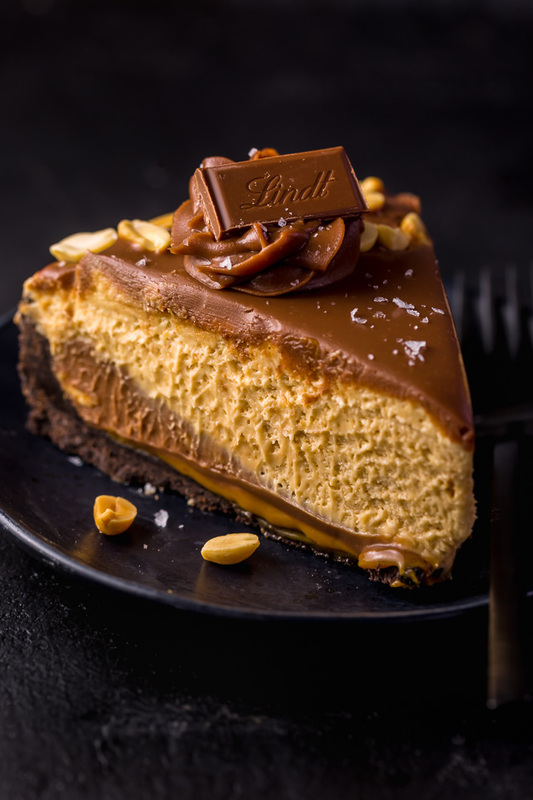 In the bowl of a stand mixer fitted with the paddle attachment, combine the cream cheese, peanut butter, and confectioners' sugar and beat on medium speed until well-combined; about 2 minutes. In a separate large bowl, using a handheld electric electric mixer, beat the cream until stiff peaks form, about 2 minutes. Add half of the whipped cream to the peanut butter mixture and beat on low speed until just combined. Add the remaining whipped cream and, using a large rubber spatula, fold until evenly combined. 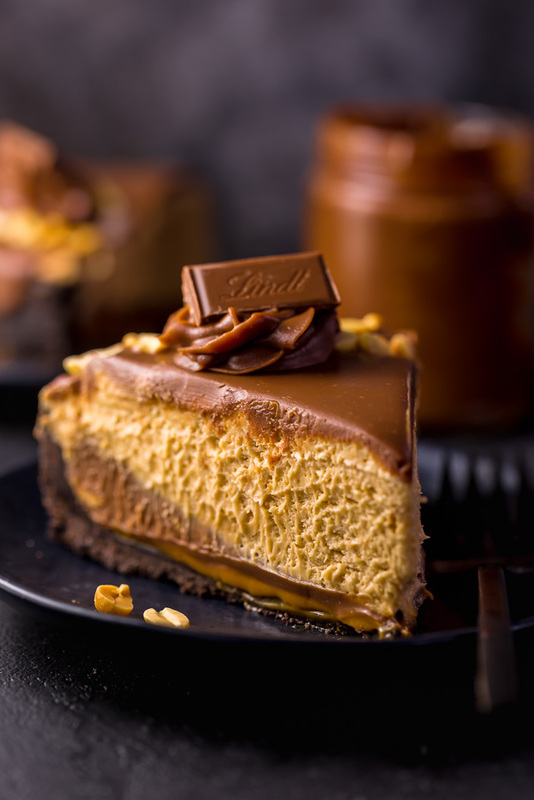 Remove the crust from the fridge and gently spoon the filling on top of the chocolate layer. Smooth the surface, then refrigerate, uncovered, for 2 hours. In a small saucepan over medium-heat, bring the cream to a low simmer. Remove from heat. Pour the cream on top of the chopped chocolate and whisk well to combine. Cool until the mixture is barely warm. 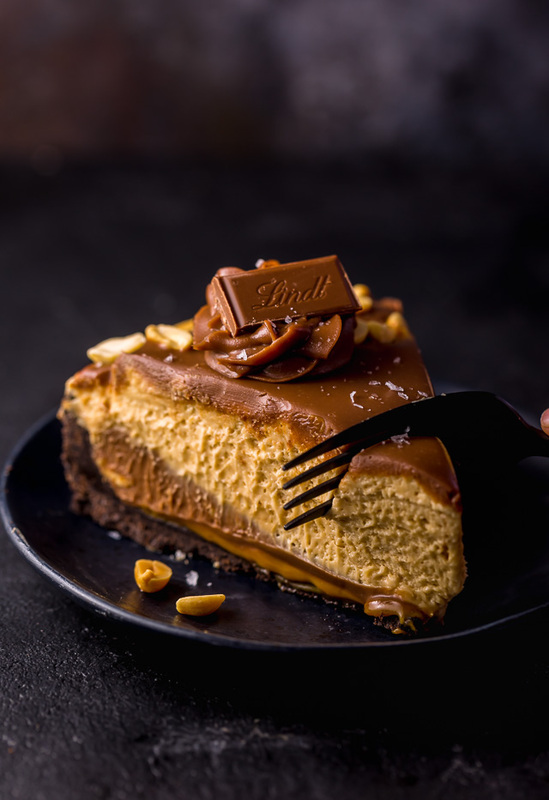 Spread the milk chocolate topping over the semi-chilled peanut butter pie. Sprinkle peanuts around the edges of the pie. Chill, uncovered, in the refrigerator for 6 more hours. Carefully remove the rim from the pan by gently running a thin knife around the crust to loosen it, then remove the springform ring. Use a sharp knife to cut the pie into wedges. Wipe the knife clean between each cut. Serve at once. This pie should be chilled until right before serving, as it is very creamy and will begin to weep when it becomes warm. Make-Ahead Instructions: This pie can be made up to two days ahead, then covered and refrigerated until ready to serve. Would I be correct in assuming you mean real peanut butter since you didn’t specify a peanut butter product (Kraft, Jif….)? Any substitution for the dulce de Leche ? Or recipes if I am unable to find it in the store ? Hi Rebecca! You can always order it online 🙂 Or there are tons of recipes online that look pretty easy. I haven’t tested this recipe with a substitute, so I can’t suggest anything confidently. However I think you could replace the dulce de leche with a chocolate ganache layer? It would change the flavor profile but still be delicious. 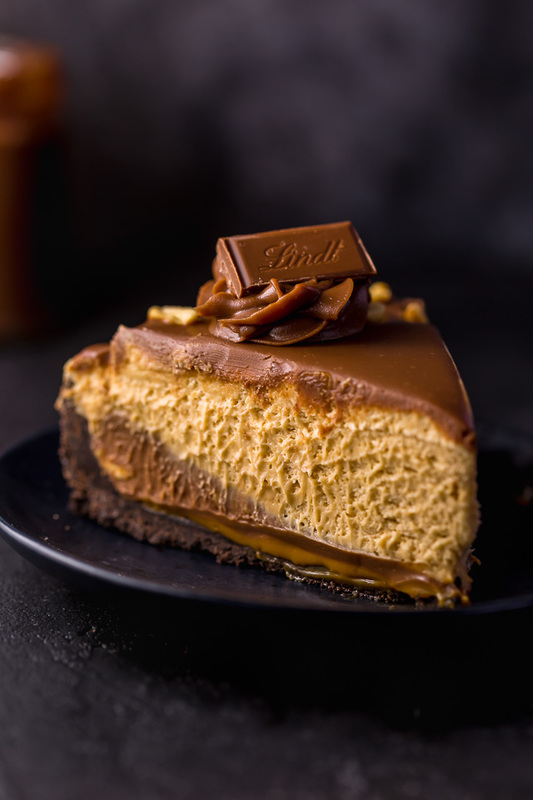 What did you use to make the chocolate swirl on top to mount the piece of the chocolate bar? Hello! Your recipes look really amazing! I’m planning of making this pie to treat my colleagues. As it will need to spend time out of the fridge when transporting it to the office I’m wondering if I can add a small quantity of gelatin to the fillings so that the pie doesn’t get runny.